The world’s most famous natural and cultural heritage sites are threatened by risks linked to climate change including rising sea levels to extreme weather, the United Nations Educational, Scientific and Cultural Organization (UNESCO) has warned in its report, “World Heritage and Tourism in a Changing Climate (2016)". The report gave a miss to the iconic Great Barrier Reef in Australia and the Sundarbans in India. The report documents climate impacts on 31 natural and cultural World Heritage sites in 29 countries from Africa, the Arab World, Asia and the Pacific, North America, Latin America and Europe. These sites are most vulnerable to increasing temperatures, melting glaciers, rising seas, intensifying weather events, worsening droughts and longer wildfire seasons, warns the report. It has explained the climate impacts at iconic tourism sites—including Venice, Stonehenge and the Galápagos Islands—and other World Heritage sites such as South Africa’s Cape Floral Region Protected Areas; the Port, Fortresses and city of Cartagena, Colombia; and the Shiretoko peninsula in Japan. A study published in March 2014 too had warned that 136 World Heritage sites are threatened by rising sea levels over the next 2,000 years. However, this new report looks at the impact of other threats, including wildfires, increasing temperatures and droughts too. “Climate change is affecting World Heritage sites across the globe,” said Adam Markham (read interview of Markham with Down To Earth), lead author of the report and Deputy Director of the Climate and Energy Program at UCS. “Some Easter Island statues are at risk of being lost to the sea because of coastal erosion. Many of the world’s most important coral reefs, including in the islands of New Caledonia in the western Pacific, have suffered unprecedented coral bleaching linked to climate change this year. Climate change could eventually even cause some World Heritage sites to lose their status.” The report also refers to the publicly accessible online World Heritage State of Conservation Information System (http://whc.unesco.org/en/soc) for other reports which have identified climate-related threats. According to http://www.abc.net.au/ all references to climate change's impact on World Heritage sites in Australia have been removed from the report as demanded by Environment Department, Australia. The report initially included information about the Great Barrier Reef, as well as Kakadu National Park and the Tasmanian wilderness. The Sundarbans, recognised as a World Heritage Site in 1987 too has not been listed in the report. 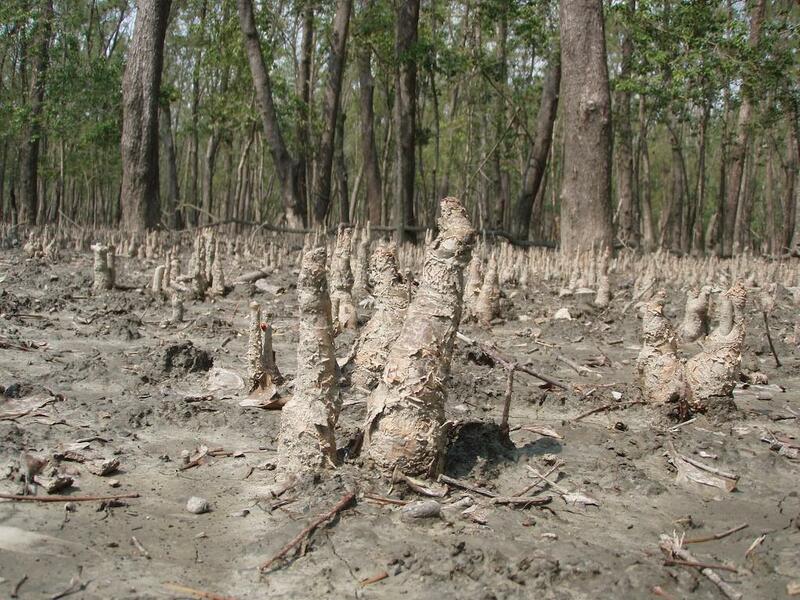 The low-lying mangrove forests are highly susceptible to the effects of sea-level rise. Both, the Great Barrier Reef and the Sundarbans have not been listed in the Postsdam study and this UNESCO report. In fact, the Potsdam study had warned about the impact of sea-level rise on 4 major Indian sites including the Elephanta Caves, a group of monuments at Mahabalipuram and the famous Sun Temple at Konarak, Odisha. At least nine out of these sites are the famous national parks known for their unique ecosystem and rich biodiversity in Africa, Asia-Pacific and the Latin America. For example, Komodo National Park in Indonesia is known for Komodo dragon (Varanus komodoensis), the largest living species of lizard and one that exists nowhere else on Earth. Increased rainfall associated with climate change in the very dry Komodo islands could inundate lizard breeding areas and change the vegetation to habitats that are less hospitable to them, warns the report. Just less than 50 percent of the world’s remaining endangered 880 mountain gorillas (Gorilla beringei beringei) live in south-western Uganda’s Bwindi Impenetrable Forest National Park. Gorillas are iconic here and the gorilla tourism has the potential to generate US$ 151 million each year. But the mountain gorillas which are already under threat from human encroachment and habitat loss—are put at longer-term risk from climate-driven changes in their forest habitat and from the potential increase of transmission of diseases from humans in a warmer world. Rice terraces of the Philippine Cordilleras, the exceptionally beautiful and important cultural landscape, which draws tourists from all over the world, is highly sensitive to climate change and is suffering from landslides as a result of the worsening extreme rainfall events, are major problems. Through all of its nearly 500-year history, Cartagena in South America has been inextricably tied to the sea. The city now faces its greatest modern challenge as a result of accelerated sea-level rise, coastal flooding and shoreline erosion. The walls, parapets, forts and buildings that comprise the World Heritage site are subject to varying degrees of risk. This report demonstrates the urgent need to better understand, monitor and address climate change threats to world heritage. It suggests an early warning system to alert protected area managers of the emerging problems. It demands a global assessment of climate risk to all World Heritage sites, so that the most vulnerable sites can be identified and resources for preparedness and resilience can be directed to the most at-risk sites. “Globally, we need to better understand, monitor and address climate change threats to World Heritage sites,” said Mechtild Rössler, Director of UNESCO’s World Heritage Centre. World Heritage sites must have “outstanding universal value,” says the report and recommends World Heritage Committee to consider the risk of prospective sites becoming degraded by climate change before the sites are added to the list. The new 2030 Agenda for Sustainable Development and the Sustainable Development Goals (SDGs) offers an important opportunity for World Heritage. The 2030 Agenda addresses cultural heritage in the context of sustainable development for the first time. Target 11.4 of the SDGs calls for “strengthening efforts to protect and safeguard the world’s cultural and natural heritage” and directly reflects the World Heritage Convention, which was the first international treaty to link these two elements. In the Paris Agreement, the new emphasis on preventing deforestation will increase the importance of forest conservation efforts in World Heritage sites, their buffer zones and surrounding areas. Reductions in fossil fuel use will have the added benefit of reducing the number of World Heritage sites threatened by oil and gas exploration and development. The agreement also highlighted the need to implement a new international approach to managing climate-driven disasters by shifting from a focus on reducing disaster losses to a comprehensive management vision – building on the Sendai Framework for Disaster Risk Reduction 2015–2030. It also established the potential for World Heritage sites to become key focal points for countries in building clean and resilient futures, and this may enable developing nations to access new support, including finance. “The most important thing we can do to save World Heritage for our children and grandchildren is implement the Paris Agreement and try to meet the goal of keeping global temperature rise to no more than 1.5˚C. The planet’s thermometer is already at 1˚C, so there is no time to lose” says Markham, the lead author. Protected area tourism in a changing climate: Will visitation at US national parks warm up or overheat?